Denver’s most ample annual food and wine event took place this past weekend for the thirteenth time across downtown with events like “Dinner Under the Stars”, cocktail competitions, culinary seminars and a “Grand Tasting”. This six-day event is the Denver Food + Wine Festival which invites the public to join the region’s culinary leaders – award winning chefs, mixologists and wine professionals in exploring and celebrating Colorado’s food and beverage scene. To kick off the weekend, mixologists filled the McNichols Civic Center from top to bottom for the Shakedown Event. Which ever your preference of cocktail, you could find something right up your alley. Each and every cocktail had it’s own unique spin and was bursting with flavors - some with more traditional flavors and some more eclectic. The favorite cocktail of the night from the Ultra team was by Alex Duniluk from Ste. Ellie called, Three Corners. It started with a smooth peach flavor and ended with a smoky cheddar, a very intriguing combination that blew all of our minds. To make the night even better, there were plenty of tasty bites, cute pop up shops, and a band that had everyone on the dance floor! The main event of DF+WF weekend is Saturday’s Grand Tasting where over 40 top restaurants provide the food and Southern Glazer’s Wine & Spirits provide over 700 wines and spirits to sample! Every type of wine is available to taste at the Grand Tasting; from high end reserves, rare wine regions, French Champagnes, to affordable favorites. DF+WFis the most comprehensive “wine tasting” in the state (aside from the prestigious annual Aspen Food + Wine Classic). If that weren’t enough to keep you entertained and buzzed all day, the event also features over 200 different spirits to try ranging from straight samples, to liqueurs, cocktails, and a full Stella Artois Café. For the true oenophiles, Denver Food and Wine created a Tasting App to help one navigate and take notes on all the fine wines. There are also QR Codes placed next to each wine and spirit for guests to learn more and take screenshots for later, and of course the educated reps are there ready to tell you all about their products too. The restaurants the other big component of the festival and provide guests a taste of Denver’s best local and regional flavors. 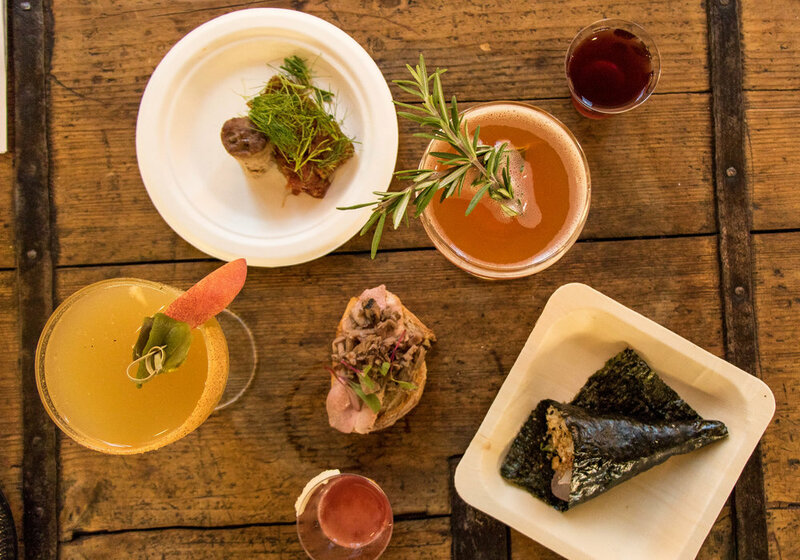 This year’s favorite bites included The Fort’s chimichurri steak and mashed potatoes, the Art Hotel’s pork belly with quinoa, Departure’s Ahi tuna, and the Noshery’s sweet treats. DF+WF’s eventsalso include bites from local, emerging talent in the form of culinary high school students who are part of the Colorado ProStart Program. It is a two-year foodservice and hospitality management, culinary arts, and business entrepreneurship curriculum offered to high school juniors and seniors in Colorado. Aside from all the food and wine consumption, be sure to take a break at the Culinary Stage where celebrity chefs host informative seminars and demonstrations every hour. This year’s presenters are Chef Mike Garaghty, Executive Chef of Wüsthof-Trident of America, Inc. presiding and appearing in WÜSTHOF- sponsored television segments, retail events, cooking videos, social media initiatives, trade shows, consumer food festivals, etc. Chef Brother Luck best known as last year’s Top Chef participant and from winning his episode on "Beat Bobby Flay”. Third is Executive Chef Craig Dixon of Main Shack and locally at Bar Dough. DF+WF events are truly bubbling over with booze and you will find yourself in bed early after the Grand Tasting. If you’re up for it, the final event is Sunday’s Rise + Dine the next morning which will surely finish your booze-infused weekend off right!